Thanks to all who joined us for Jazz Along the Charles: A Walkable Concert at the DCR Charles River Esplanade on Sunday, September 23, 2018! Check out the recap video from the event below! 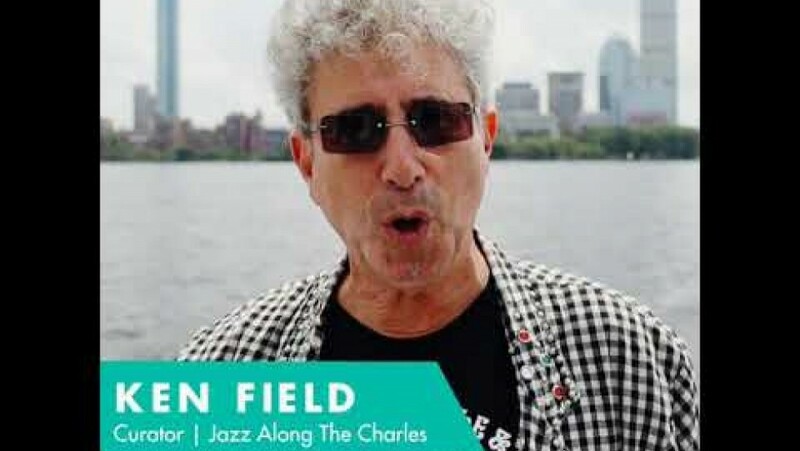 25 jazz ensembles gathered at a series of connected, walkable locations along the Charles River Esplanade, interpreting a curated list of Boston-related tunes in one collective concert that celebrated the great jazz community in Boston today. These 25 jazz ensembles came together simultaneously to interpret the same set list in their own style. The audience strolled along a one-mile stretch of the Charles River, discovering new songs, artists, and areas of the Esplanade. What a dynamic and evolving jazz concert experience! Jazz Along the Charles was a free public event, part of Celebrity Series’ commitment to free public performance experiences for the people of Boston. Previous Celebrity Series projects have included Street Pianos Boston (2013 & 2016), Le Grand Continental (2014), and Let’s Dance Boston! (2015 & 2017). 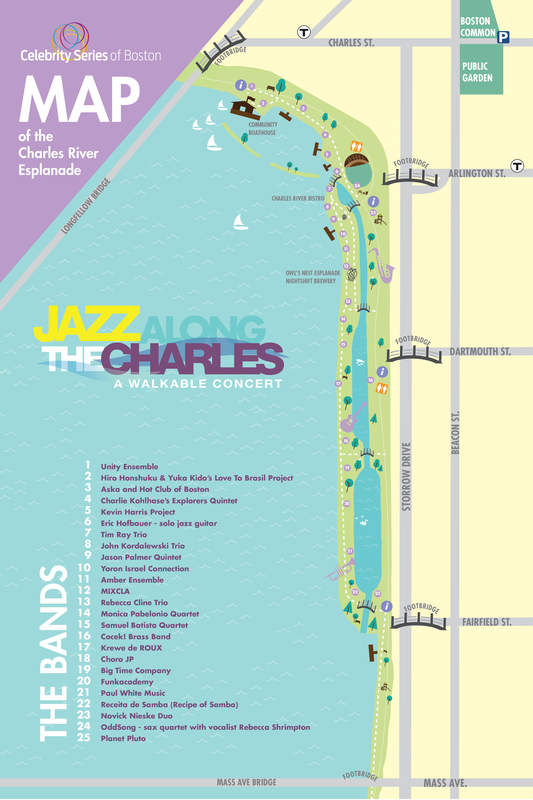 Be sure to share your videos and photos using #jazzalongthecharles. You can also relive the fun with Celebrity Series on Facebook, Twitter, or Instagram! Visit our season calendar or our free Neighborhood Arts performance calendar to learn more about all of our 2018-2019 offerings! The unique set list for this event was curated by composer, saxophonist and band leader Ken Field. Read the full set list and curator's note and an interview with Ken on our blog. 1.1 Dirty Water (Ed Cobb/The Standells) A top-ten hit for Los Angeles-based band the Standells in 1967, the song was written by their producer Ed Cobb based on some of his impressions of Boston. 1.2 The Night (Mark Sandman/Morphine) Sandman’s Boston-based group Morphine was an international sensation in the 1990s. Members of the group have continued performing as Vapors of Morphine after leader Mark Sandman’s tragic and fatal heart attack while performing on stage near Rome, Italy in 1999. 1.3 Boston Marathon (Gary Burton) Renowned vibist, composer, and educator Burton had a 30-year affiliation with Berklee College of Music, and performed and recorded with musicians including Gato Barbieri, Carla Bley, Chick Corea, Peter Erskine, Stan Getz, Hank Garland, Stephane Grappelli, Herbie Hancock, Keith Jarrett, B.B. King, Steve Lacy, Pat Metheny, Makoto Ozone, Tiger Okoshi, Astor Piazzolla, Tommy Smith, Ralph Towner, and Eberhard Weber. 1.4 I Got It Bad (and That Ain’t Good) (Duke Ellington) This Ellington song is often associated with alto sax player Johnny Hodges, who was one of Duke’s favored soloists. Hodges was born on July 25, 1907, in Cambridge, and raised on Putnam Ave. The family later moved to Hammond St. in Boston’s South End. 1.5 Boston Beans (Peggy Lee) From the 1962 Peggy Lee release Blues Cross Country, this song was composed by Peggy Lee with Bob Schluger & Milton Raskin. Born Norma Deloris Egstrom in 1920, Peggy Lee was a prolific songwriter, and composed lyrics and/or music for more than 150 songs. Known as Miss Peggy Lee, she was the inspiration for the Muppets’ Miss Piggy. 1.6 Back Bay Boogie (Benny Carter) The 1946 recording is based on a riff that Carter used to play with his sextet at the Ritz-Carlton Hotel. A major figure in jazz from the 1930s to the 1990s, Benny Carter was granted an NEA Jazz Masters Award in 1986, a Grammy Lifetime Achievement Award in 1987, and the National Endowment for the Arts National Medal of Arts in 2000. 1.7 I Got It (Ken Field/Revolutionary Snake Ensemble) Field is a member of the Boston-based art-rock group Birdsongs of the Mesozoic, and leads the Revolutionary Snake Ensemble, an improvisational brass band. He was named a 2017 Finalist in Music Composition by the Massachusetts Cultural Council, and has composed music for Sesame Street. He is the music curator for Jazz Along the Charles. 2.1 Boston Bernie (Dexter Gordon) The great Dexter Gordon’s melody over the chord changes to “All the Things You Are,” from the 1969 Prestige release More Power! 2.2 Sweet Baby James (James Taylor) With a line about the snow in early December covering the “Turnpike from Stockbridge to Boston,” this song, written for Taylor’s then-newborn nephew “Baby” James, is one of his many classics. Taylor the elder was born at Boston’s Mass General Hospital in 1949. 2.3 Loaded (Lilith) Released on the album Apology Plant by the Boston-based duo Lilith (Hannah + Kelsey) in 2017. 2.4 Boston (Augustana) "Boston" is a song by California rock band Augustana, from their debut album All the Stars and Boulevards (2005). The song propelled the group to national prominence when it was used on the TV show One Tree Hill, and was later also featured on Scrubs, Big Bang Theory, and a few others. 2.5 Maria (Leonard Bernstein, from West Side Story) American composer, conductor, author, music lecturer, and pianist Leonard Bernstein was born in Lawrence, and studied at Boston Latin School, Harvard University, and at Tanglewood. His teaching positions included stints at Harvard and Brandeis, and he appeared many times as guest conductor of the Boston Symphony Orchestra. 2.7 Boston April 15th (Enrico Rava, composed by Javier Edgardo Girotto) This composition is by Italian saxophonist Javier Edgardo Girotto, who studied at Berklee College of Music and lived in Boston from 1987 to 1991. It appears on the 2003 Enrico Rava CD Full of Life. The date in the title is that of the 2013 Boston Marathon bombing, but the composition predates that event. 2.8 Peace (Horace Silver) Longtime theme song for Boston radio host Eric Jackson’s legendary nightly jazz radio program Eric in the Evening, this song was composed by the great Horace Silver and recorded by his group in 1959. Curator Note This is a small selection of songs that have Boston connections—there are many important Boston-area composers, musicians, and band leaders who have not been included, only because of the finite nature of this project. Jazz Along the Charles set list curator Ken Field outlines the September 23 event. Jazz Along the Charles is sponsored by Leslie & Howard Appleby, Amy & Joshua Boger, the Stephanie L. Brown Foundation, Donna & Michael Egan, and the Barr Foundation through its ArtsAmplified initiative, with additional support from The Boston Foundation. This event is made possible in part by the LIVE PERFORMANCE! Arts for All Endowment & Innovation Funds of the Celebrity Series of Boston. This concert is produced in cooperation with the Department of Conservation and Recreation and the Esplanade Association, with in-kind support from Gentle Giant. Special thanks to JazzBoston for promotional assistance.